The city woke up to a rebellion. The smell of revolt around every corner. Workers took to the streets and took up arms. Taken by force they stood firm. The experience of this struggle was transferred to the next generation, which repeated the endeavor. Surrounded, they fell, repeating with more enthusiasm and clarity, into yet another isolation, defeat, and a new state of cyclic conflict. In this manner we could describe every revolutionary quake that threatened with its energy and power to shake down the existing order of things during the 20th century. However many historians, journalists and politicians try to fit the revolt of Polish workers into its unnatural ideological frame, the fact remains that – because of its essential being – it cannot be torn out of the context of “underground” history. This repeats itself on essentially the same basis, but with specifically new conditions which gives each a new and richer meaning. That underground history we call by one name: Revolution. The 1956 events in Poland are a part of this “other side” of history. The retreat of the Nazis from Poland and the arrival of Soviet troops brought a new turning point to the political life of Poles. Empty, devastated and robbed, Poland had little choice but incorporation into the new order. Polish Communists under the patronage of Moscow played a key role in leading this new direction with their subscribed ideological model. In ten years the land was transformed and rebuilt from top to bottom through mass mobilization, something a crippled bourgeoisie could not have done. Poland, in those ten years, survived a new “industrial revolution”. But the so-called “building of socialism” was a fiction. Essentially, nothing changed, with an exception of demand for incorporation into the margins of the Soviet Union’s economic system. New forces were brought out by the accelerated development of the productive forces – in connection with the individual's role in unchanged relations of wage labour - capital – and developed their own psyche whose demands were in opposition to the wishes of the ruling bureaucracy and the managerial cadres. Nationalisation, collectivisation, industrialisation – processes of creating a unified capital in the hands of the state (Party) helped in creating a unified enemy: real people to whom struggle against alienation and mass commodity production remained a primary concern. The psychology of rebellion spread throughout the workers and youth of Eastern Europe. After Stalin’s death, first regroupments amongst east European bureaucracies had driven the proletariat of Eastern Germany to revolt and call upon the “government of revolutionary workers” to rise (1953). This uprising was quelled, but it signaled the beginning of a revolt whose intention would be widely realized. The social terrain of new Poland from its first year was uncomfortable because of the echoes of internal party conflicts. Subscribed Stalinism suffered a crisis from day one so there were many necessary political liquidations, starting with a removal of the wing which called for “a Polish road to socialism” (with the imprisonment of Władysław Gomułka in 1947), followed by the fusion of all Left fractions into one Polish United Workers’ Party (PZPR). It just so happened that the party finally established long term stability when Khrushchev denounced the “public secrets” of Stalin’s terror, signalizing the end of Stalinist discipline. Bureaucrats all over the Eastern Bloc, feeling a loosening of Moscow's strings, started more freely to experiment in their own limited domains. In Poland, a “party line” could have been redefined in conditions of mild liberalization of political life. A new climate was felt all over. Reforms “from above” which would loosen up relations within the ruling structure affected everyday life and its own atmosphere. Together with Gomułka, 28 thousand political prisoners were released. Of course, life as such went on and kept all existing forms and relations. It happened so that mild liberalisation only brought worsening conditions in the sphere of production. Industrial norms, because of the shift in demands, could only rise, while the appetites developed by managerial cliques could finally be expressed in unrealistic plans for the future. The promise of a raised standard of living crashed into the walls of steamy factories. In this climate workers were encouraged to speak in public about their living problems, while the censor’s office was encouraged to let a lot through. New breaths of freedom and the omnipresent motive to resist were combined in a collective articulation of opinion sharing and critique. In many public places a critique of state policies and the ruling structure was brought out. 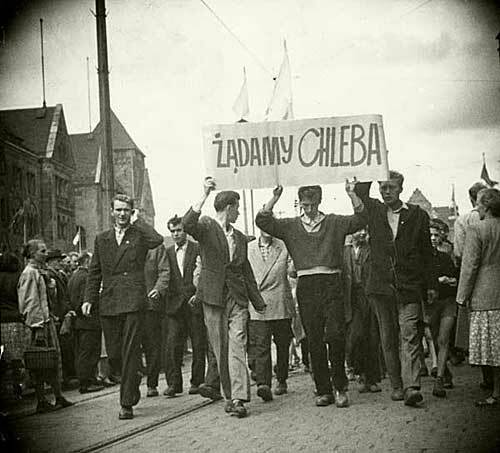 In October 1955 groups such as Krzywe Koło (opposition writers) appeared, and after them, especially among work collectives, militants who set forward a critique “from the left”. Magazine “Po prostu” (Quite simply) – which would later on take the “all power to the councils” parole – was the most read among the students and workers who stood in lines in front of the kiosks in search for the new “unofficial” press. Of course, even before 1956, open struggle in the workplaces never really ceased. The production norms kept rising, wages kept falling, overtime was paid less and taxes were getting bigger. It was only a matter of time before people took the streets. Work conditions and irregularities in the management process challenged the workers of Zispo metallurgy plant in Poznań to take it up with the government. A delegation of 17 (10 of them from the management offices) went to Warsaw on June 26th to appeal to the Ministry of Engineering and the Central Union Council. Promises given to the delegation were withdrawn the same day on a minister’s request. So the next day saw a frustrated reaction: mass meetings were held that formed the basis for an informal workers’ council. Demands were voted on and delegates were chosen, which was followed by a great deal of interest from other factories. That day, many factories decided to call a “wildcat strike”. In Zispo, there was a classic workplace occupation. Early that dawn, around 6 a.m., workers left the factory in a large group which travelled towards city center, calling upon the workers of other workplaces to join them. In the matter of 3 hours - on the central plaza in front of the old castle surrounded by administrative buildings which were occupied by police contingents - there were about 100,000 people, workers and students with their families. A delegation (probably chosen before the demonstration through work-group contacts) was sent to the city authorities to demand negotiations with the prime minister and high ranking party representatives. After two hours of waiting the first rumors came to circle the massed workers, at first untrue, about a delegation being arrested. In the atmosphere of paranoia and impatience, groups were formed to scatter and occupy the administrative buildings. A large group of demonstrators took the buildings of the city prison and offices of the hated state security. Prisoners were released. After that, the first shots came from the direction of the state security building, but were responded to almost in that same moment when demonstrators seized weapons from the prison stockroom. In the afternoon a large group broke into the building of the district courthouse where they burned personal files and other documentation. By that time the government had made its first moves: afteractive patrollers were disarmed and 16 tanks overwhelmed, the Deputy Minister of Defense, General Stanisław Popławski, arrived at Ławica airport and ordered the 2nd armored corps to enter the city followed by the 19th armored division at 6 p.m. Since all kinds of weapons taken from all possible administrative and security stocks fell into the hands of rebels, government troops were taken on by a prepared urban guerilla which patiently waited for the attack to commence. The fighting started at 18:00 hours and lasted throughout the night till 4 a.m., when government troops seized control in most of city areas. According to official data, 746 people were captured, 74 killed. The army lost 8 men, while 600 people on both sides were wounded. The last standpoint of armed resistance was the place where it all began: in the Zispo factory complex, where wildcat strike action and occupations continued for the next two days followed by sporadic gunfight through the city. It’s no wonder that authorities had to deal with disarmament for several days on, since the whole city was used as a shelter. The armed uprising was finished. Soviet intervention at that time proved to be unnecessary, as domestic politicians proved themselves able to cope with the insurgents. In a well known speech, Józef Cyrankiewicz declared with audacity: “Anyone who raises a hand against the people’s state, will have that hand cut off!” However, the conflict between the “people” and the state, that is, between the workers and bureaucracy, continued. Political content in voicing an opposition lost its primal fear. General slogans such as “We want freedom” or “Russians go home” gave way to concrete action and critical voices in the workplaces and community. Across the country, in industrial centres, groups of autonomously organised young workers appeared, and they worked on formulating theoretical and practical articulations of their dissatisfaction. Authorities called them “provocateurs, counter-revolutionaries and imperialist agents”, but on the contrary, their role was of irreversibly revolutionary character. The Party fell into a critical situation and leaders’ sudden fear led to heavy rethinking. Rhetoric was quickly changed: anything that could be controlled and restructured “from above” was acknowledged as a fact. The old slogan of a “Polish road to socialism” was restated as a rhetorical line in the moment of bureaucratic self-preservations. Religious and political freedoms, increased wages and loosened police control was promised. So-called “agents provocateurs” suddenly became “honest workers with just demands”. Of course, by that time, workers went further from mere objections. The leaders knew it. As a concession to the mass movement, workers’ councils were acknowledged as official bodies within the workplaces, but with merely an economic role, by which their massive potential – and their essential role – was far from fulfilled. Russians could not have been satisfied. Khrushchev, in the moment of arrival of the PZPR member of the central committee to the congress which was supposed to ratify changes mentioned above, activated troops around Warsaw and sent Soviet navy ships to the port of Gdansk. Workers declared their will to stand up to the intervention. It remained for the Party to show which side is it on: when workers occupied factories and asked for weapons through their councils, the Party refused. Khrushchev, together with Mikoyan, Bulganin and Molotov, on October 19th, landed on Warsaw airport, raising his fist at a delegation of Polish leaders which left the conference to greet the unexpected guest. That 8th plenary meeting of the PZRP central committee, declared the following changes: Władysław Gomułka, former leader of the “patriotic” fraction, became the new secretary general. Political prisoners were released, again, including those imprisoned after the “Poznan process”. Gomułka was clear: Poles would resist Soviet intervention if it became necessary, but he promised that changes concerned only Poland itself, so no dropping of any “Moscow line” would take place. Thus, the Russian delegation accepted the new course, but only under one condition: if the new leadership showed itself capable of checking and controlling the anti-bureaucratic mass movement that spread through the country. In January 1957, the promise of new elections was fulfilled up to a point, but opposition was not allowed to put forward any candidates. In place, people were given an option to vote against official candidates only. Gomułka managed to persuade the Catholic Church to voice support: out of 457 seats PZPR took 237, while the rest was given to satellite organisations and few independent candidates. Now, the circle could have been closed. Of course, turnout itself remains in question. Since they seized the Parliament and restated lost legitimacy, the Communist leadership managed to consolidate its power. Instead of the promising one, old hideous Gomułka returned, turning his “patriotic tendency” into a cynical Polish nationalism turned against the Germans on the outer, and Jews on the inner field. “Enough gathering, enough demonstrations!” echoed Gomułka’s speech to those which helped him back into power. But the rebellious youth and workforce never listened. Poland never really settled down. When the government banned “Po prostu”, four days of riots shook Warsaw. When workers’ councils were abolished and banned in the course of next year, a clear thought remained stuck in the heads of the people: if the struggle should go on, picking up where Poznan fell, at first, the Party’s supremacy would have to be destroyed. It remained like an objective, a spectre haunting Poland, and as it turned out, the whole Eastern Bloc. The mass movement of Polish workers, followed by a mass revolution of Hungarian workers, is a perfect historical demystification which whittles away the cold war mythology, of the “real socialism” and the “free world”, telling us loud and clear how a “different reality” is possible, how it is a goal of this “hidden history” which reveals itself through every trace of struggle of the real people against the world which puts them down and turns them into alienated objects. This is an English translation of the original Serbian. Further editing by libcom from the translated version.